Martin Cunningham Grierson FCSD FRSA FSDC, has been recognised for his outstanding career as a designer and maker of furniture and his significant contribution to the British furniture industry with The Furniture Makers’ Company Lifetime Achievement Award. 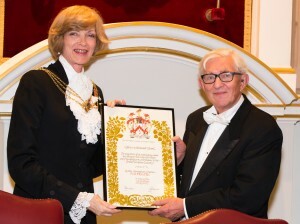 He was presented with his award by the Representative Lord Mayor Dame Fiona Woolf DBE at the Installation Dinner for the new Master on Wednesday 13 May. After his graduation with distinction from the Central School of Arts & Crafts in 1953, Martin worked in several architectural practices and then in the 60s as a freelance designer for several British and international companies, notably Walter Knoll, Kandya, and Collins & Hayes.